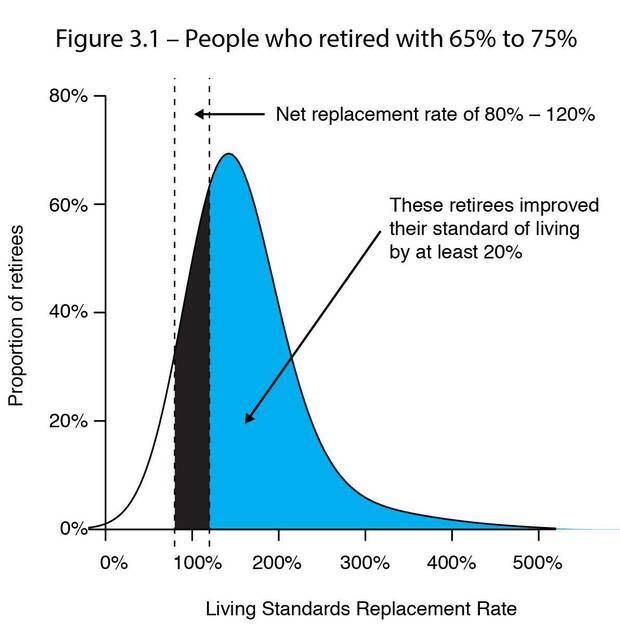 Is a 70% retirement replacement income target too high? The following excerpt is from Fred Vettese's new book Retirement Income for Life: Getting More Without Saving More. 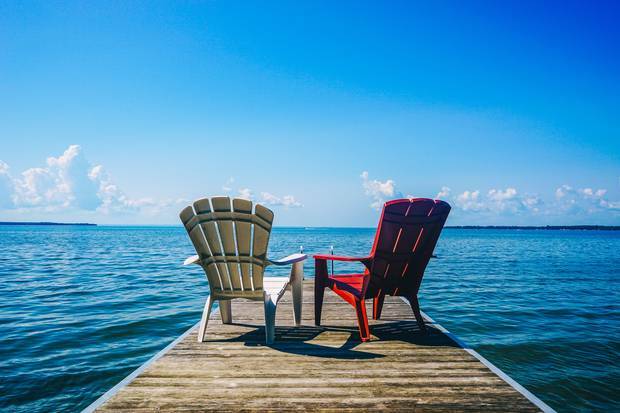 The traditional advice for middle- and high-income earners is to shoot for a retirement income target of 70 per cent of final average earnings. Carl and Hanna earned a combined $120,000 a year in their final working years, so 70 per cent translates into a target annual retirement income of $84,000. That sounds like more than they can possibly generate from $550,000 in savings, and it is. Fortunately, their real target is lower. "You don't need as much money as the financial industry says you do. Sure, more money is better than less, but we sacrificed a lot to max out our RRSPs every year and then also max out TFSAs when they came along. I see now that we needn't have sacrificed so much while working. In fact, I find we have more money to spend in retirement than we had when we were working. Not having to furiously save for retirement frees up a lot of cash." What makes this study so significant (and to my mind, credible) is that it was not commissioned by a taxpayer coalition or a right-wing think tank with an axe to grind. The authors were academics who simply followed the data. If your employer enrolled you in a defined benefit pension plan that generates a replacement rate in the 70-per cent range, then count yourself lucky. You can put this book down and go work on your golf game or your gardenias. If you need to generate income from your own savings, however, the good news is that you don't have to stress out if such a lofty target proves to be unattainable; it is probably not your real target. If the retirement income target is not 70 per cent, then what is it? As we will see, it can be almost anything you want it to be. To illustrate, I will compute a retirement income target for Carl and Hanna. Their two children were grown up and weaning themselves off the family payroll by the time Carl and Hanna were within six years of retirement; the children were totally self-supporting two years later. Thanks to lower child-related expenses, Carl and Hanna started to save a lot more in those last six years. Once they had paid off their mortgage (when Carl was 61), they had even more disposable income. They had the usual work-related expenses as well as CPP and EI deductions right up until the day they retired. This is all captured in Figure 3.2, which is admittedly a little busy. The main message is that various types of expenditures can greatly reduce the income that working-age people have available for regular spending. The black portion of each bar in the chart indicates the amount that is available to them for regular spending, after deducting all their other expenses. Let's take away the noise now and focus only on regular spending. Just how much income do Carl and Hanna need to maintain their regular spending after retirement? I figured out this in steps, starting with deleting all the other spending items shown in Figure 3.2 except regular spending. Then I expressed regular spending as a percentage of gross income instead of showing it in dollar terms. Finally, I grossed up those percentages to reflect the income tax Carl and Hanna will have to pay in retirement. The result of this exercise is shown in Figure 3.3. We now have a basis for determining their retirement income target. The second conclusion is that the amount of money available for regular spending (or saving) can jump dramatically once mortgage payments and child-related expenses drop off. Consider, for example, that the last three years in both of these charts are mortgage-free, and so the average amount available for regular spending is 64 per cent, which is almost double what it was at age 55. A 64-per cent spending rate is almost certain to be unsustainable over the rest of their lives unless Carl or Hanna comes into a big inheritance. They would need a lot more savings to make such a high target work. Fair enough, you might say, but what if they had saved enough money in the years leading up to retirement to support a spending rate of 64 per cent? Well, they could have done that (maybe), but saving a lot more means having even less income left over to spend. As a result, they would never have experienced anything close to a 64-per cent spending rate during their working years. Can you see the Catch-22? Even some pension experts who should know better seem to gloss over it. How then should Carl and Hanna set their target? Let's agree it is inappropriate to cherry-pick and consider only the three years of their lives when their capacity to spend was by far the highest. It is equally inappropriate to pick the lowest three years in the last 10. Perhaps they should base their target on the entire 10 years instead. After all, spending habits tend to change slowly, so the longer averaging period is a better predictor of spending habits that they might carry into retirement. The average percentage of income available for regular spending over their final 10 years of work was 47 per cent. This may seem modest compared to 64 per cent, but it still represents a level of consumption that Carl and Hanna never enjoyed at any time before they reached age 60. To summarize, Carl and Hanna will have some leeway in setting their retirement income target. It's nice to have a higher income, of course, but one has to be realistic. If Carl and Hanna set their income target at 47 per cent**** - and then round it up to 50 per cent just to have a little cushion – they should feel content in the knowledge that they will be spending more on themselves in retirement than they ever did in their working lives (except maybe for the last three years). All we have to do now is find a way to make that 50-per cent spending rate sustainable. Printed with permission from Retirement Income for Life by Fred Vettese. Fred is the chief actuary at Morneau Shepell. * For the record, I'm not even the first one to say it. Malcolm Hamilton has been expounding on this theme since the 1990s. ** Many thanks to Bonnie-Jeanne MacDonald, who not only coined the term Living Standards Replacement Rate but also gave me permission to use the chart in this book. *** In fact, it would only be 33 per cent if I hadn't grossed up the number for income tax payable. **** Grossed up to reflect income tax payable. They actually spent closer to 43 per cent in those final 10 years.